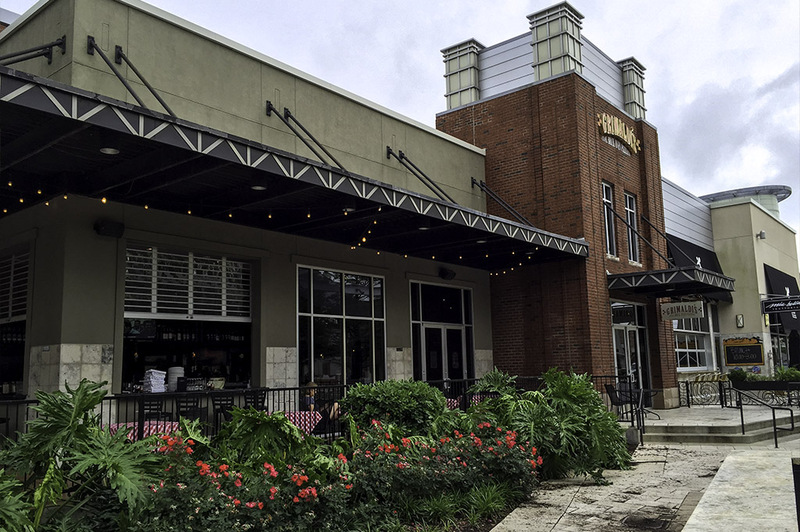 Grimaldi’s Pizzeria is located in First Colony, just outside the First Colony Mall. 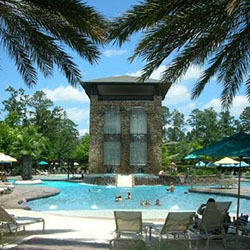 They have two other locations in the Houston area; one in the Woodlands and the other in Katy. This fast-growing Brooklyn-based pizzeria also serves brick-oven pies & calzones to satisfied customers in a dozen states nationwide. 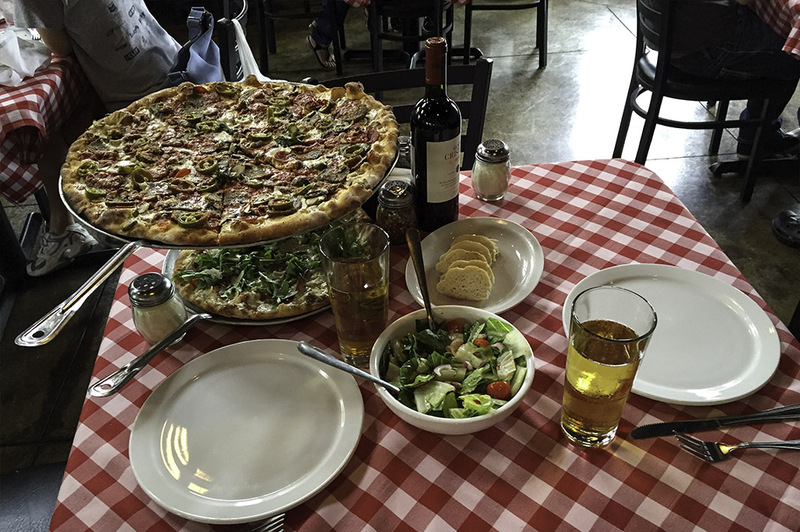 It’s no wonder Grimaldi’s Pizzeria is a fan favorite here in Houston as well as all over the country. 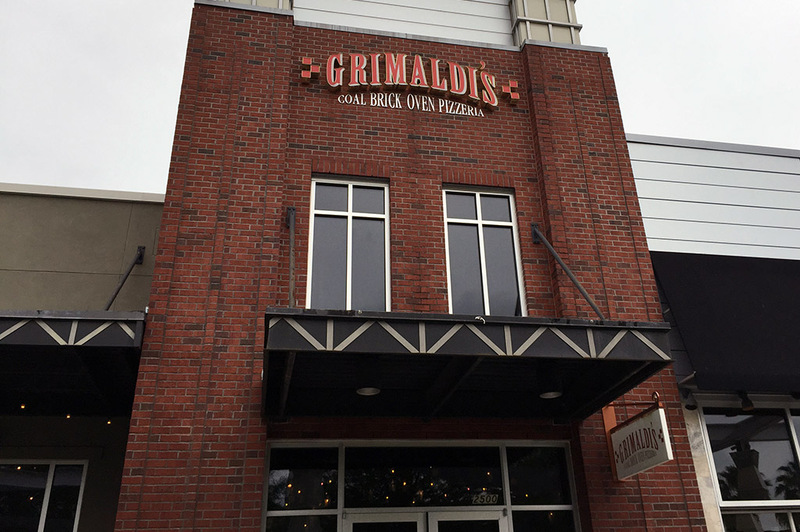 With over 100 years experience in making specialty pizzas in coal-fired brick ovens, Grimaldi’s pizzas are distinctive, authentic, and just plain good! I was soon to find out how true that statement is! 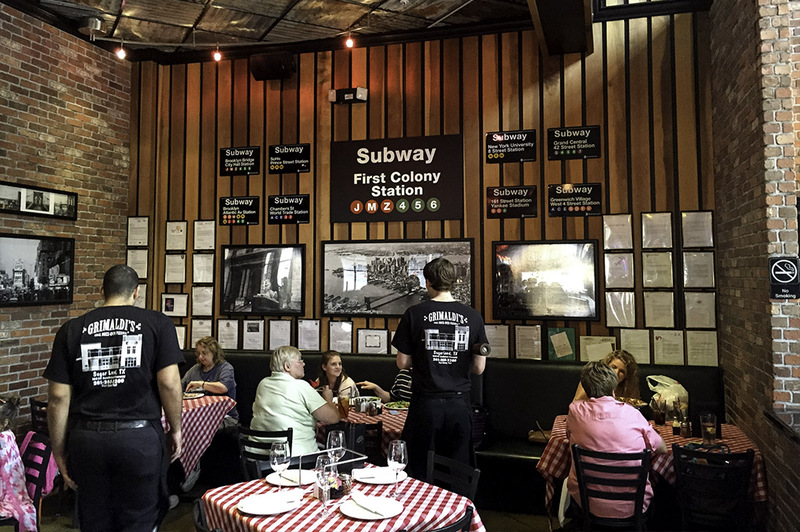 When you walk into Grimaldi’s Pizzeria, it’s like being transported back to classic New York City. The red brick walls and red-and-white checkered table cloths set the stage for the journey on which we were about to embark. 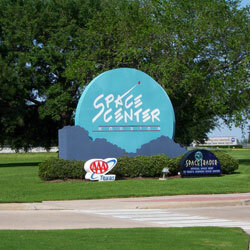 The local subway system signs are a great touch that let you know you are still in Sugar Land. 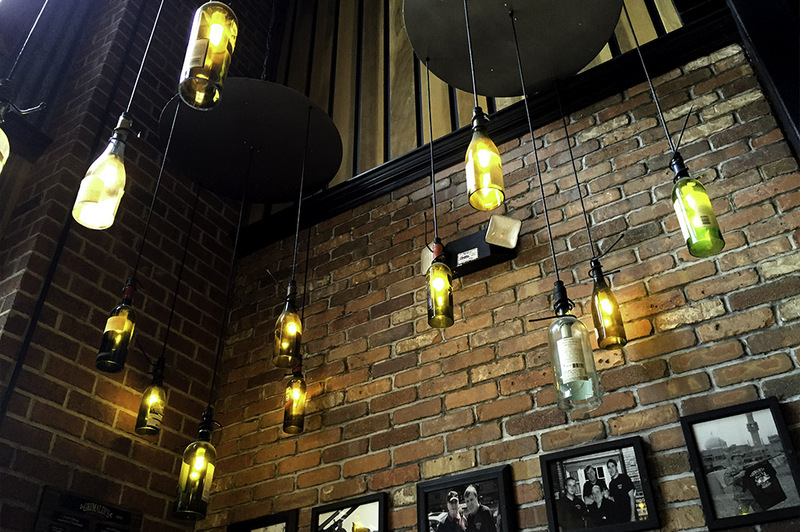 The brick pizza oven sits in the middle of the restaurant like a shrine. By the time the aroma from the oven hits you like a ton of bricks (pun intended) it is too late… you are in too deep. 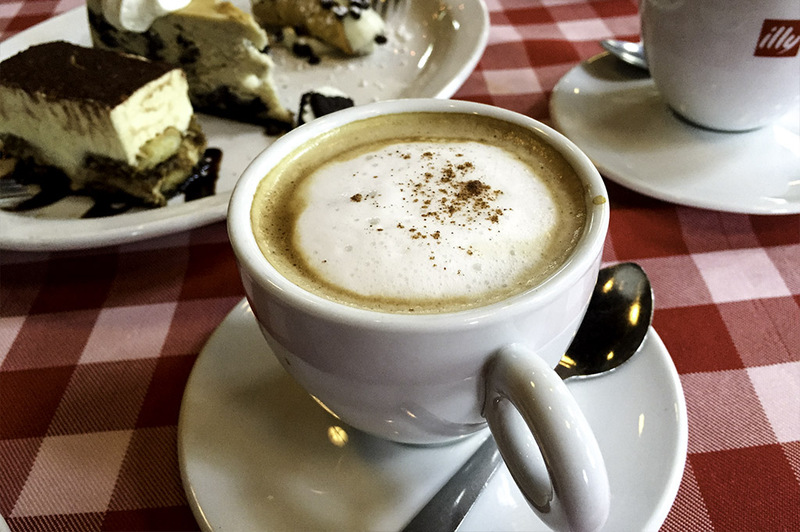 When we stopped by Grimaldi’s on a beautiful Saturday afternoon, it was plain to see that we weren’t the only ones who had discovered this wonderful Italian pizzeria. Every table was full of happy people enjoying the day with friends and loved ones. We ordered a couple of Peronis, which is a definite must when enjoying great pizza. 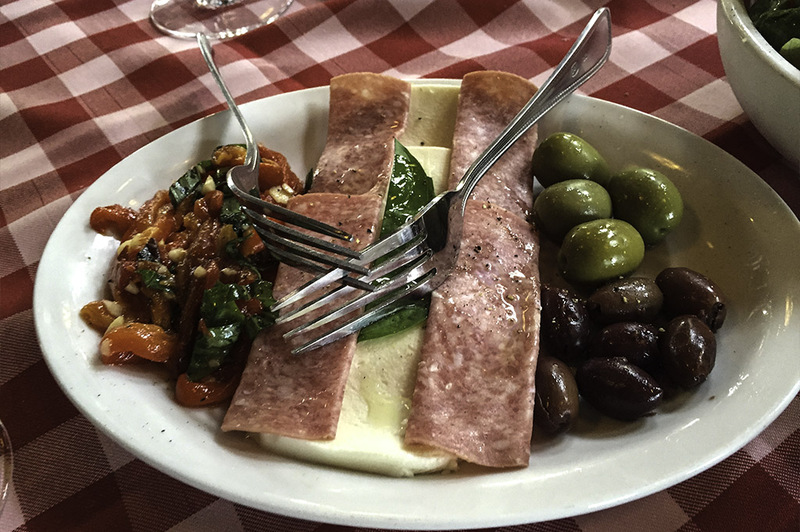 For our appetizer, we decided to try the Antipasto, which proved to be a great choice. As you can see in the photography, this beautifully-presented plate was an arrangement of fresh Mozzarella, oven-roasted sweet red peppers, Genoa salami, olives and fresh-baked bread. I definitely suggest the Antipasto for starters. Now, you know how I feel about my salads! 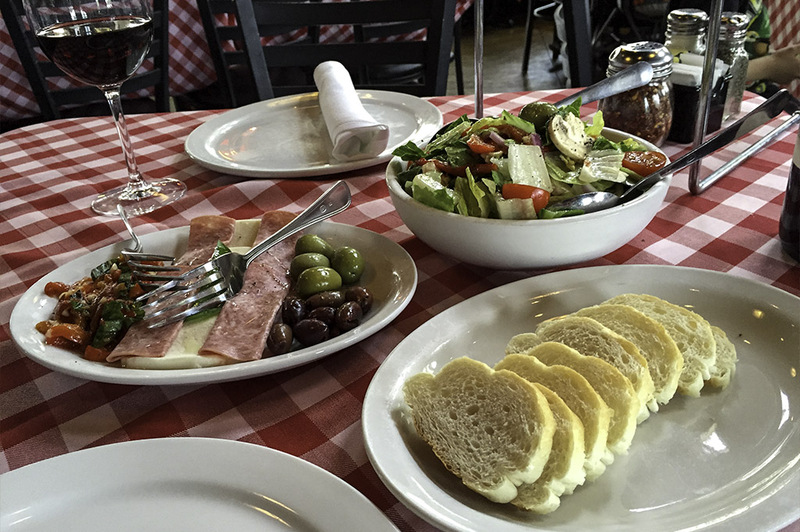 Grimaldi’s House Salad was suggested by our server, so we went with that. 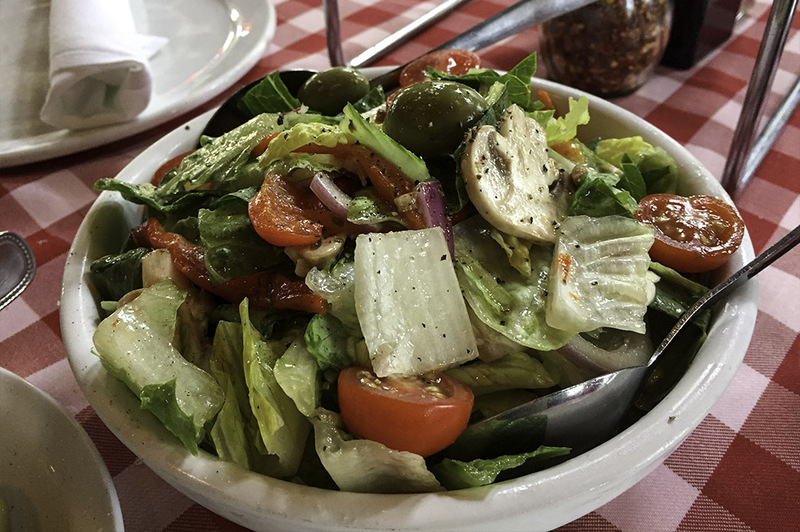 This tasty combination of romaine lettuce, red onion, cherry tomatoes, oven-roasted sweet red peppers, mushrooms, Sicilian green olives, and savory vinaigrette was delightfully fresh, crisp and full of flavor. The cherry tomatoes were like little juice bombs bursting in your mouth and the red onions gave it that spicy tang that is making my mouth water as I write this! As we enjoyed the salad, the first of our two specialty brick-oven-pizzas arrived and what work of art! It was such a thing of beauty that I almost didn’t want to slice it up. I said almost. 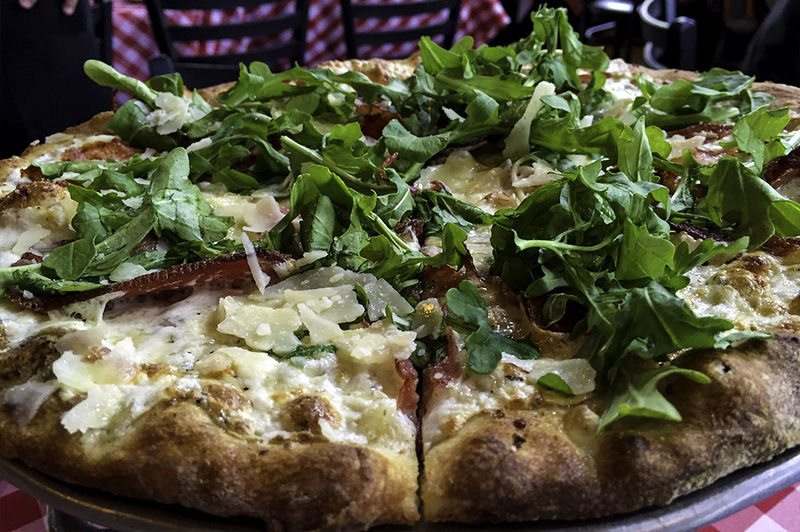 We had ordered Grimaldi’s Pizza of the Month, the Prosciutto Arugula Specialty Pizza. This classic white pizza was topped with sliced prosciutto, a shaved cheese blend and fresh arugula. Unbelievable! I absolutely love white pizzas and the Prosciutto Arugula was exactly what I had been hoping for. If you aren’t familiar with white pizzas, you don’t know what you’ve been missing! I find they have a much lighter taste and with the fluffy, crispy crust… it’s something special. Now for my go-to. 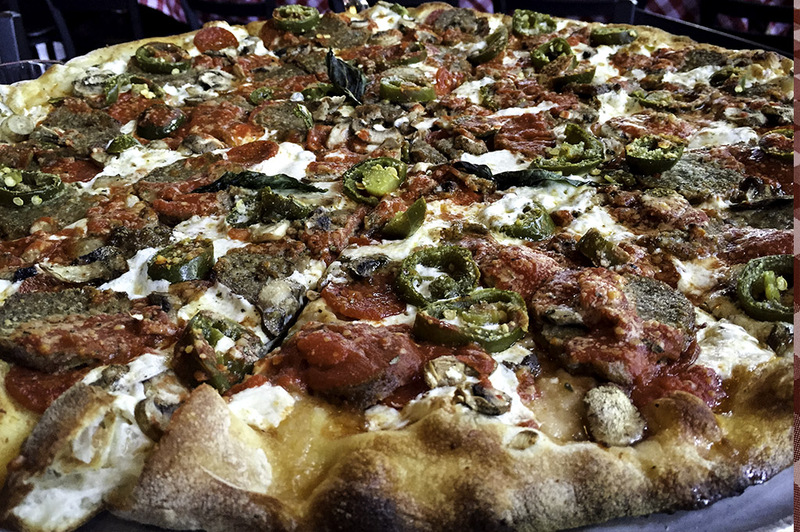 I had to try my personal favorite, the pizza I always order when I’m not trying to jump outside the box; a traditional New York thin crust spread with classic tomato-based pizza sauce and topped with pepperoni, meatballs, mushrooms and jalapenos. 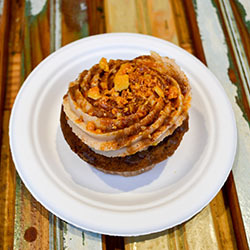 This precious, crispy treat was so rich with flavor it made my cheeks pucker. The house wine was the perfect compliment to this marvelous brick-oven gem. I just love the refreshing vinaigrette side kick from the salad in between bites of such a rich pie. 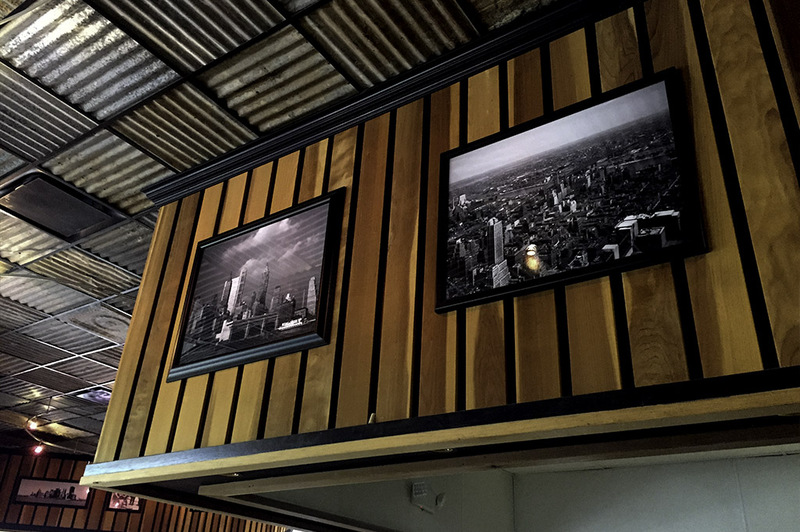 Then, a sip of wine and I am thrown back to the old block in a New York minute. You can tell that Grimaldi’s uses only the finest, freshest ingredients, an element which I feel separates the good from the great when it comes to pizza. We had ordered a large pizza because it just doesn’t feel right to leave an awesome pizzeria without a few slices to take home, right? In my book, enjoying the perfect pizza pie is an all-day event. Time for dessert! And, if I thought our meal couldn’t get any better, it did! 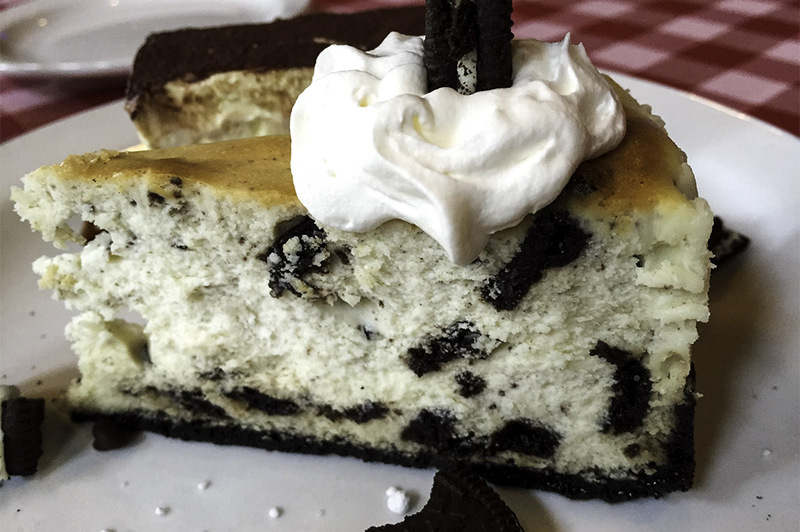 Grimaldi’s Pizzeria offers a variety of delicious, decadent desserts. 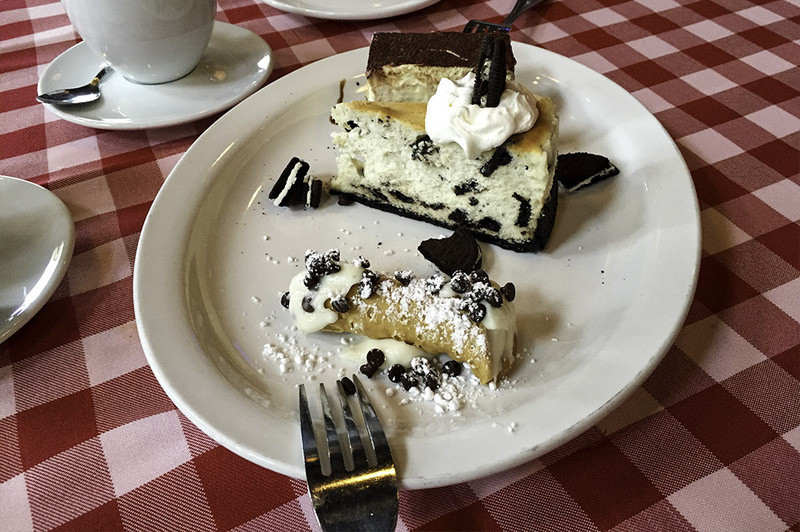 Now, I usually order a couple anyway, but at Grimaldi’s I recommend you get the Dessert Trio. 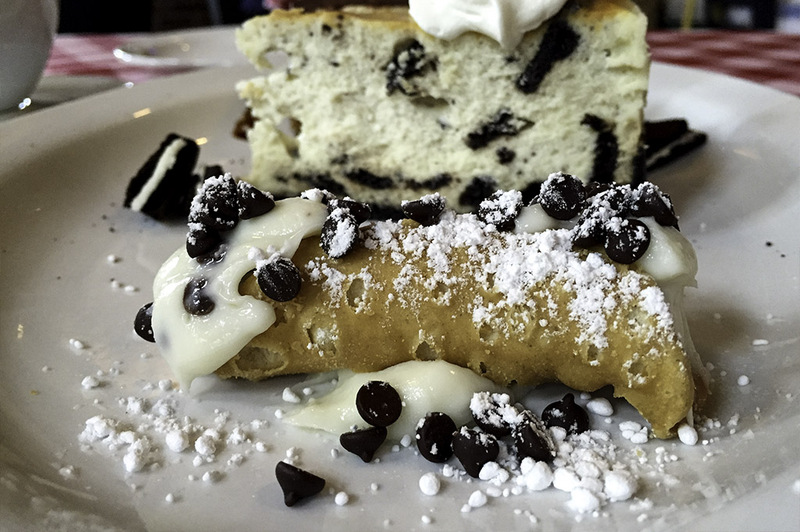 This three-dessert sampling includes the house-made cheesecake, Cannoli, and Tiramisu. I know it sounds lame, but I really can’t recommend just one as each one has its own unique flavor and texture and all are simply irresistible. 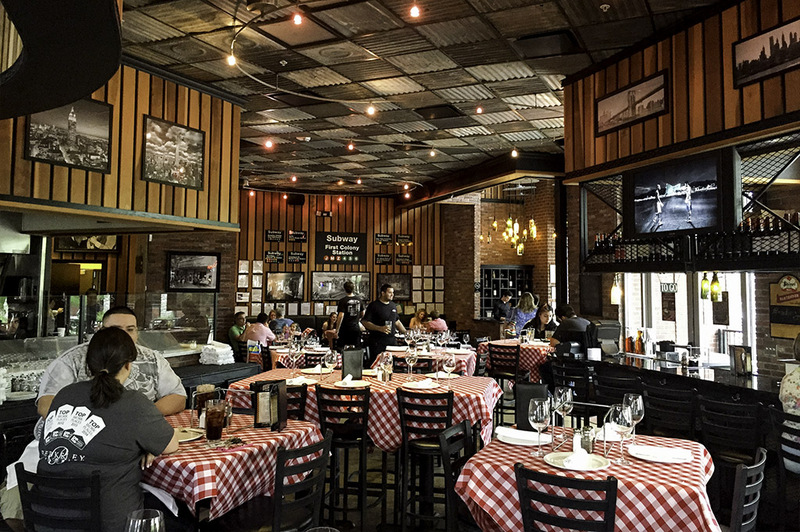 For the best dining experience at Grimaldi’s Pizzeria, I suggest you take your time and enjoy everything this new Houston favorite has to offer. 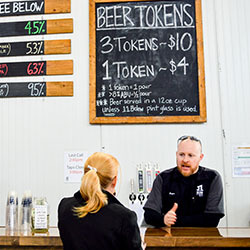 Unlike the fast-paced city in which it began, this pizzeria fits right in with our laid-back Texas culture… so just relax and make it an all-day festivity!